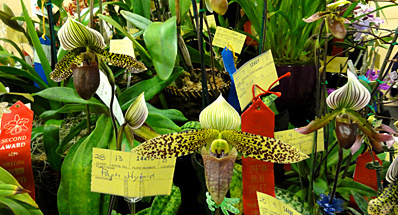 More orchids are killed by incorrect watering than by any other reason. There are two separate components to proper watering; when and how. 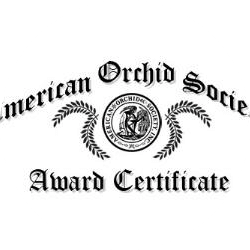 The vast majority of orchids grown by hobby growers are naturally found on trees above the ground where the light is more plentiful. These plants (epiphytes) are adapted to having their roots exposed to light and air so in addition to water, orchid roots need air. Orchids should be watered just as they begin to dry out. 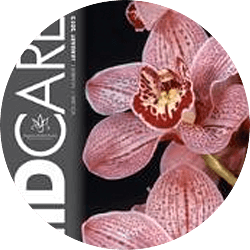 This rule applies to all orchids with slight variations depending on whether your plant has the ability to store water or not. 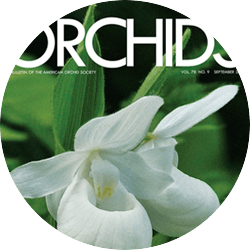 Orchids such as cattleyas and oncidiums should be allowed to dry completely between waterings while orchids such as phalaenopsis and paphiopedilums that have no water storage organs should be watered before dryness occurs. There's is no magic formula for how often to water. This is because your growing area is different from anyone else's. 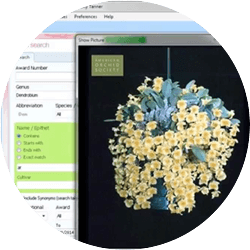 Temperature, humidity, air movement, potting mix (type and age), and light levels all play a role. There are several ways to determine when a potted orchid is almost dry: 1) the surface of the potting mix will appear dry when the potting mix is moss; 2) dry pots will feel lighter when lifted. After a few watering, you will be able to tell by the weight of the pot whether or not it is time to water again. If in doubt, wait a day. 3) clay pots feel dry; 4) a pencil or wooden skewer inserted into the potting mix will come out almost dry. If in doubt, a finger inserted into the potting mix is perhaps the best tool to determine the moisture content of the potting mix; it causes no harm to the plant. A bark mix dries out faster than a moss potting mix. It is best to water your plant in the morning to give the moisture on the leaves time to dry during the day. If any water remains in the crown (where the leaves join in the center) use a paper towel to blot the water to avoid crown rot. You should water more frequently when the temperatures are warm and decrease watering when temperatures are cool. Keep in mind that temperatures close to the window on a windowsill will be colder or hotter than your general house temperature. 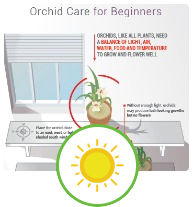 Avoid having the plant in the direct line of the heat or air conditioning ducts. When orchids are watered, they should be watered copiously. Place your plant into the sink and let the water run freely from the drainage holes for about a minute. Do not use salt-softened or distilled water. Allow the plant to drain completely. This is an opportunity to examine how the potting mix behaves. If you cannot pour water rapidly through the pot, the potting mix is too dense and you run the risk of starving the roots for air. If you see finely divided material that looks like coffee grounds in the water coming from the drainage holes, your potting mix is breaking down and it's time to repot into fresh mix. Finally a couple of notes about mounted plants and plants grown in baskets without additional potting mix. 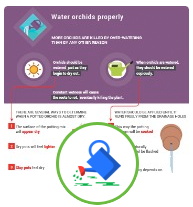 Avoid dunking the plants in buckets of water. This practice very easily spreads diseases. Two short waterings a few minutes apart are much more effective than one long watering. Once water runs off the plant, the roots will have absorbed essentially all they can at that time and excess water simply runs off to the ground. Water your plants and then a few minutes later water them again, always beginning with the first plant you watered. This allows time for the roots of the last plant watered to finish absorbing water before you wet them again. Roots that are completely saturated will be a solid color while those that are not will appear mottled. 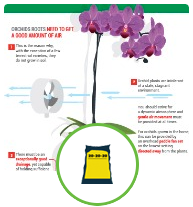 More information on watering orchids can be found here.